Niche line Arquiste has launched Sydney Rock Pool, a new mineral amber musk fragrance. The surf crashes against the sandstone rocks. Your skin glows in the warm sun underneath a blazing Australian sky. As you climb out of the water, a gentle breeze blows through the nearby jasmine and frangipani trees, mixing with the subtle scent of sea, salt and rock. Sydney Rock Pool was developed by perfumer Rodrigo Flores-Roux. The notes include mineral accord, coconut skin accord, sandalwood, driftwood, narcissus, frangipani, jasmine, seaweed, ambermax and sea salt accord. 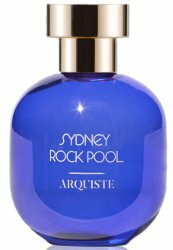 Arquiste Sydney Rock Pool is available now at World in New Zealand, in 100 ml Eau de Parfum. How fabulous – New Zealand gets in early on something! I went to a pre-launch event at World in Wellington in March. The salty notes in Sydney Rock Pool aren’t my thing, but I met Carlos Huber and heard more about the line, and had a very nice evening. Oh what fun! I think it is somewhere in Australia too, and the rest of us don’t get it until later in the year. So cool that you got to attend the pre-launch! Carlos Huber is at Montreal’s Etiket this weekend, hopefully we’ll get to smell it! I was really disappointed when I received my sample. It reminded me of a sweeter version of Bruno Fazzolari’s Room 237. It also reminds me strongly of Garner Fructis shampoo (not a compliment for a nearly 200USD perfume). I think the Narcissus elevates it fro, smelling like a complete cheap shampoo, but still it made me cringe.